As a large-format custom print solution-provider, Portage, Mich.-based Agio Imaging has been meeting the wide-ranging graphics needs of both local and national clients since 2002. From creating custom special-event displays to high-end interior décor, retail-store signage, wall coverings, banners and trade-show exhibits, Agio Imaging recommends digitally direct-printed rigid substrates for their durability, sleek appearance, fast production times and improved color saturation. Rigid substrates are recommended based on the requirements of individual applications, according to Davina Logan, director of sales and marketing, Agio Imaging, who says the company specializes in digital direct printing on a wide range of rigid substrates from PVC to metal, acrylic, glass and foam board, including several graphic display boards from 3A Composites USA. The choice of rigid substrate often is dictated by the application’s end use as well as client budgets, according to Logan. 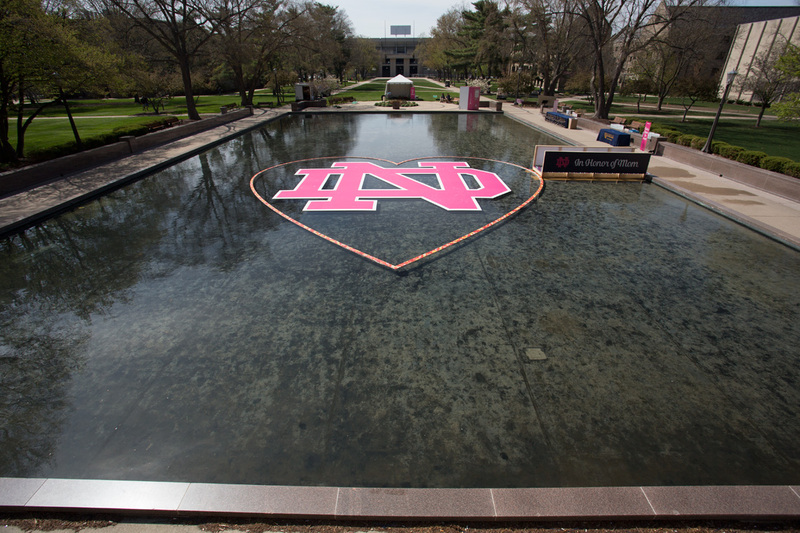 While Agio Imaging employees are adept at determining the best rigid substrate to meet application needs, they’d never been asked to create a large-scale display that could float before being approached this spring by the University of Notre Dame’s Alumni Association regarding a Mother’s Day event to be held at the university’s Hesburgh Reflecting Pool. The University of Notre Dame – founded in 1842 adjacent to South Bend, Ind. – has ties to the founding of Mothers’ Day. University alum Frank Hering lobbied for a nationwide holiday to honor mothers starting in 1904 after being moved by a Notre Dame professor’s regular classroom assignment requiring students to write penny cards to their mothers. Affectionately known as “the father of Mother’s Day,” Hering is among several advocates – including Anna Jarvis (“the mother of Mother’s Day”) – who lobbied over several decades for the holiday signed into effect in 1914 by President Woodrow Wilson. 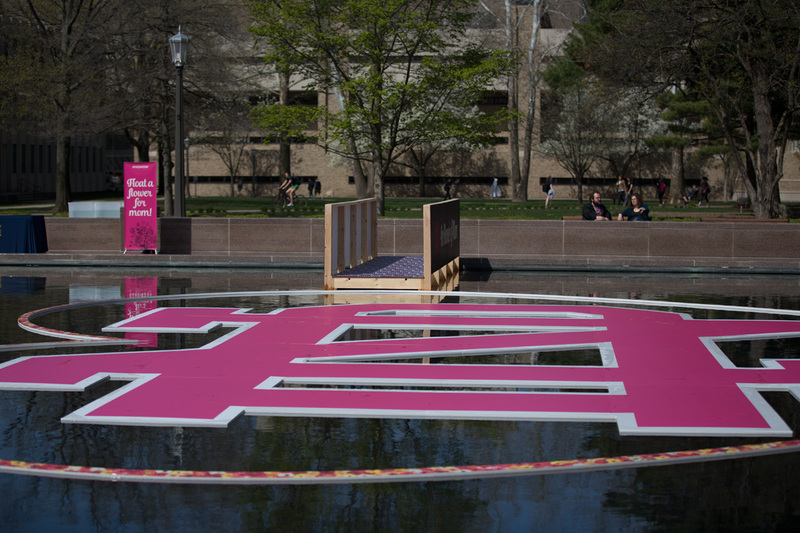 In recognition of both mothers and the university’s historical link to the creation of Mother’s Day, the university’s alumni association decided to go big with graphics this year at a special campus event held April 29 in honor and remembrance of moms. 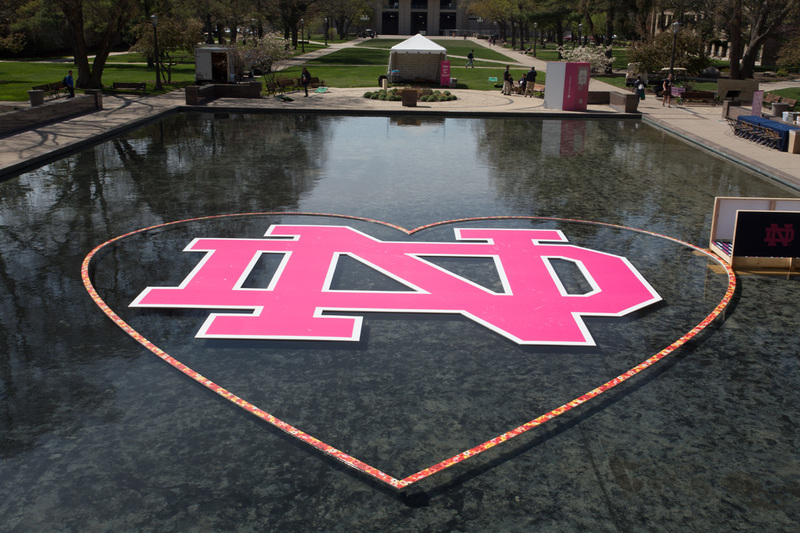 Agio Imaging was contacted about creating a massive “ND” interlocking-letter university logo within a giant heart that would appear to be free floating in the 72-foot by 136-foot reflecting pool. Students and other event attendees would be invited to float 3,000 Gerber daisies in honor of their moms within the heart-shaped display. Agio Imaging chose 3A Composites’ Gatorplast® graphic display board – supplied by the Grand Rapids, Mich., branch of distributor Laird Plastics – for direct printing display graphics with a super-wide format UV printer. To test Gatorplast’s reflecting-pool readiness, Agio Imaging employees float-tested a Gatorplast panel in a tub of water for five days with excellent results, assuring the company that Gatorplast’s closed-cell polystyrene foam could stand up to the approximately 24 inches of water in the university’s reflecting pool during the afternoon event. Agio Imaging’s creative team utilized Adobe Creative Suite to engineer the heart display – with exterior dimensions of 41-feet by 50-feet. White Gatorplast panels in the 1-inch thickness and 48-inch by 96-inch sheet size were digitally direct printed with a Gerber daisy flower pattern, then CNC routed to shape and to a width of 4 inches. The 24 Gatorplast heart display pieces were attached to each other with custom-milled Dibond plates and screws. The Dibond plates were specially engineered by Agio Imaging’s production team. 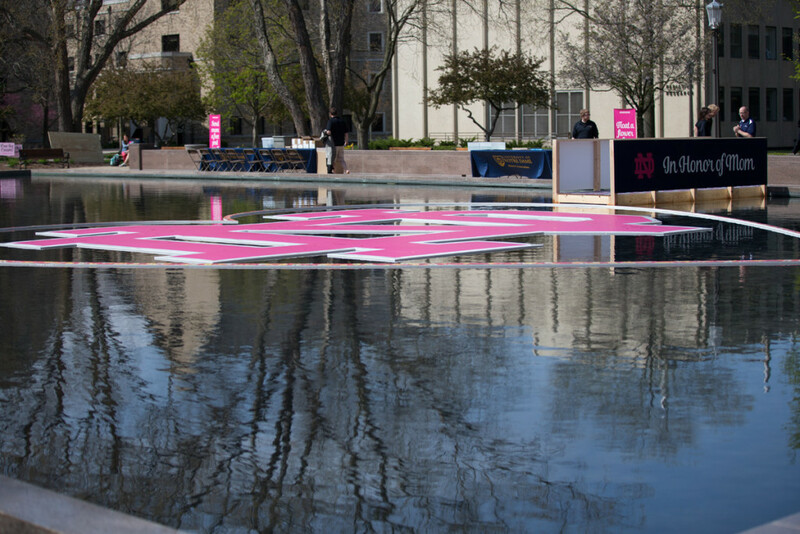 To create the appearance of a free-floating display, Agio Imaging used black sandbags and clear nylon line to anchor the floating shapes in place without being visible in the pool. The custom-milled Dibond plates were attached to the underside of the heart and screwed through Gatorplast’s styrene facer and foam center onsite. 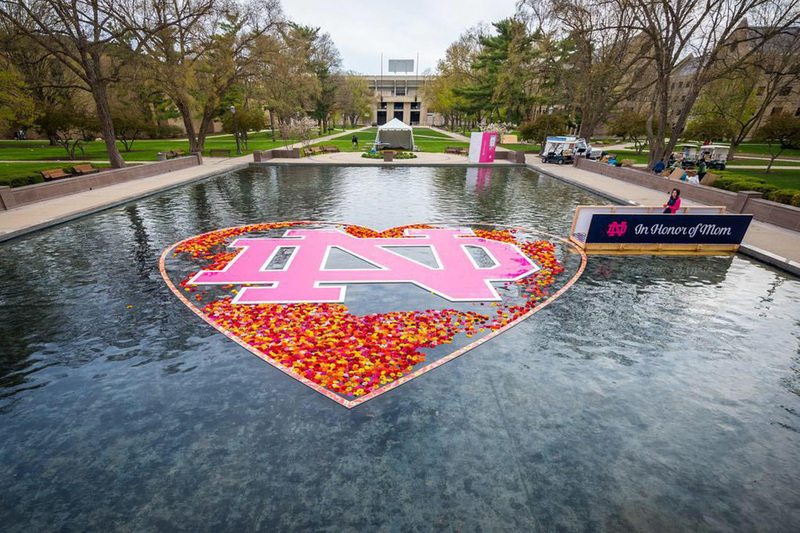 The university’s 29-foot by 21-foot interlocking “ND” logo also was created from 1-inch thick white Gatorplast in the 48-inch by 96-inch sheet size. The logo was digitally direct-printed on Gatorplast, then CNC routed to shape. The logo’s 28 pieces were attached with custom-milled Dibond plates and screws installed onsite early the morning of the event. Black sandbags also were attached to the underside of the “ND” logo in a similar fashion to the heart graphic display.